Brett Anderson encouraged by 50-pitch bullpen session. 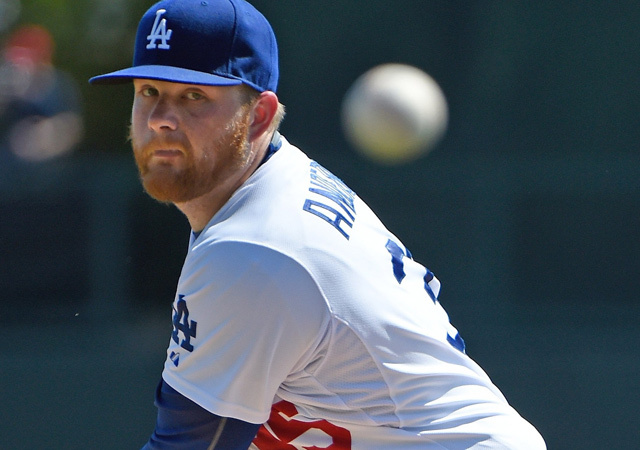 Brett Anderson‘s long road back to the Dodgers’ active roster grew a little shorter Friday. The left-hander, who hasn’t pitched this season while he recovers from back surgery in April, threw his second bullpen session this month at Dodger Stadium. Anderson said he threw three sets of 15 pitches each, with a few more tacked on to the final stanza for good measure. The final total came out to about 50 pitches. Anderson said he threw all his pitches, topping out at “probably 80, 85 percent” of maximum effort. There’s still no timetable for Anderson’s return, though manager Dave Roberts said recently that a mid-August comeback is realistic. Anderson said he’ll throw another bullpen next week (probably Wednesday) then face live hitters in a simulated game setting. Once he begins a minor league rehab assignment, Anderson said he’s hopeful that “I can get a 3- or 4-inning outing the first time.” In that case, he might not need a full 30 days’ rehab — the maximum minor-league rehab timetable allowed for pitchers. This entry was posted in JP on the Dodgers and tagged Brett Anderson by J.P. Hoornstra. Bookmark the permalink.